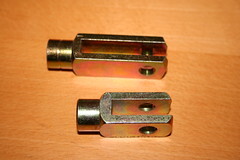 GOOster and Vikki have taken delivery of the Dual 7" Servo and a "Long" 3/8" Clevis for road going trials. PS - I got to see Vikki in the flesh today - a very nice example indeed, even without paint - and her seats are NOT pink! Have just found this link via Google. Speedway Motors in the USA do a Stainless Steel version! I'll have another look at it later. I opened up the mounting holes on the pedal box with my step drill, so it was just an unbolt and remove the old servo and bolt in the new one. The long clevis works a treat. I will need longer fluid feed lines, if this all works out, as I unbolted the reservoir and it's just resting up against the bulkhead. The elbow / one way valve on the servo needed to be removed, so my vac hose and elbow could be connected. Unfortunately, in removing the provided elbow it came apart - so I need to replace that for you, Mike. I've tested for leaks, spraying the vac entry and the adaptor plate / servo / cylinder interfaces with brake cleaner, and no issues there. Now all I need to do is try it out on the road. The stepped design of that servo seems to fit really well in the available space. I see you've fitted heat protection to the brake reservoir supply hoses which is a good idea, given that it above the exhaust. Will that be necessary? - if you have used the Metro elbow, I should be able to do the same? I was also planning to use the BMW non return elbow away from the inlet manifold, as it comes out the back of the inlet manifold. BTW - the elbow I have isn't the metro one. I never got one with my unit. I just used a (IIRC) 10mm 90 degree elbow and straight vac tube all the way back to the BMW one way valve and 'air pump' attached to the throttle body. I am sure we are all holding our breath to see the results. Don't have flexible pipes myself they are all copper tubes, so will need a bit of work to make it all fit but if results are good, then it will be worth it. Dermott O'Leary has nothing on Jason, - he is keeping us all in suspense. I have solid brake lines, but found I could manipulate mine to move forward 2" without too much difficulty: and because I have the reservoir mounted directly on the master cylinder it is almost a straight swap. Put us out of our misery Jason..........................What's the verdict ????? The verdict is..... still pending. That headache I had on Sunday was the precursor to a full on gastric flu type thing. I haven't felt that bad in years! I'm off work at the moment. If I feel a little less dizzy (all I've had to eat in 24 hours is two dry crackers... Blood sugar must be low) later today, I'll take Vikki for a spin round the block and report back. Sorry Jason - don't rush it if you are not well. Its just me being impatient. Ok - sugary cereal is the universal panacea. Felt a lot better after breakfast, so went out for a blast. right after these words from our sponsor. Well, I had to wait for you to comment. You are our sponsor, after all. Right - here's the bottom line. Braking is MUCH improved. There's a lot more feel in the pedal to my mind - you know how much braking effort is going in from the position of the pedal, not the muscles on your leg bulging under the strain. You also get the feel that the car is going to stop in time, none of that "pray and press harder" when you have to anchor up rapidly. Initial bite is much more in line with my daily drivers. So - I declare it a complete success. Gentlemen, start your credit cards! [QUOTE=GreatOldOne;24134There's a lot more feel in the pedal to my mind - you know how much braking effort is going in from the position of the pedal, not the muscles on your leg bulging under the strain. Many thanks for being the guinea pig and testing this out. It sounds like very good news. Quick question - did you make a seal between the servo and master cylinder? - I have a hunch it is not necessary, which makes the adaptor slightly easier to make, as we can do away with the O-ring and recess. Would it be worth trying without the O - ring to prove that it still works? Would you like to keep the adaptor plate, or would you prefer to make your own? I am happy either way (genuinely no offence if you prefer to make your own) - I will have to make a new one whatever, for my Cabrio as this one rotates my Sierra reservoir over at an unacceptable angle. I hope this little bit of good news has helped you feel a little better..........? May be a bulk purchase could be arranged to get a better deal - even from USA? As long as you don't mind Mike, I'll keep this plate if it's no good to you. I'm not sure if about the O ring - I just left the old one on that was on the metro servo - I'm not sure if it was sealing or not. I'll have a look in a mo. I have seen chrome ones on eBay. But they're around £90. All times are GMT +0. The time now is 13:58.